The long-sought goal of a practical fusion-power reactor has inched closer to reality with new experiments from MIT’s experimental Alcator C-Mod reactor, the highest-performance university-based fusion device in the world. The new experiments have revealed a set of operating parameters for the reactor — a so-called “mode” of operation — that may provide a solution to a longstanding operational problem: How to keep heat tightly confined within the hot charged gas (called plasma) inside the reactor, while allowing contaminating particles, which can interfere with the fusion reaction, to escape and be removed from the chamber. 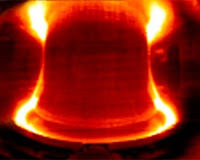 Most of the world’s experimental fusion reactors, like the one at MIT’s Plasma Science and Fusion Center, are of a type called tokamaks, in which powerful magnetic fields are used to trap the hot plasma inside a doughnut-shaped (or toroidal) chamber. Typically, depending on how the strength and shape of the magnetic field are set, both heat and particles can constantly leak out of the plasma (in a setup called L-mode, for low-confinement) or can be held more tightly in place (called H-mode, for high-confinement). Now, after some 30 years of tests using the Alcator series of reactors (which have evolved over the years), the MIT researchers have found another mode of operation, which they call I-mode (for improved), in which the heat stays tightly confined, but the particles, including contaminants, can leak away. This should prevent these contaminants from “poisoning” the fusion reaction. “This is very exciting,” says Dennis Whyte, professor in the MIT Department of Nuclear Science and Engineering and coauthor of some recent papers that describe more than 100 experiments testing the new mode. Whyte presented the results in October at the International Atomic Energy Agency International Fusion Conference in South Korea. “It really looks distinct” from the previously known modes, he says. While in previous experiments in tokamaks the degree of confinement of heat and particles always changed in unison, “we’ve at last proved that they don’t have to go together,” says Amanda Hubbard, a principal research scientist at MIT’s Plasma Science and Fusion Center and coauthor of the reports. Hubbard presented the latest results in an invited talk at the November meeting of the American Physical Society’s Division of Plasma Physics, and says the findings “attracted a lot of attention.” But, she added, “we’re still trying to figure out why” the new mode works as it does. The work is funded by the U.S. Department of Energy. The fuel in planned tokamaks, which comprises the hydrogen isotopes deuterium and tritium, is heated to up to more than 100 million degrees Celsius (although in present reactors like Alcator C-Mod, tritium is not used, and the temperatures are usually somewhat lower). This hot plasma is confined inside a doughnut-shaped magnetic “bottle” that keeps it from touching — and melting — the chamber’s walls. Nevertheless, its proximity to those walls and the occasional leakage of some hot plasma causes a small number of particles from the walls to mix with the plasma, producing one kind of contaminant. The other kind of expected contaminant is a product of the fusion reactions themselves: helium atoms, created by the fusing of hydrogen atoms, but which are not capable of further fusion under the same conditions. One of the keys to triggering the new mode was to configure the magnetic fields inside the tokamak in a way that is essentially upside-down from the usual H-mode setup, Hubbard says. The findings could be significant in enabling the next step forward in fusion energy, where fusion reactions and power are sustained mostly by “self-heating” without requiring a larger constant addition of outside power. Researchers expect to achieve this milestone, referred to as “fusion burn,” in a new international collaboration on a reactor called ITER, currently being built in France. The findings from MIT “almost certainly could be applied” to the very similar design of the ITER reactor, Whyte says. Patrick Diamond PhD ’79, professor of plasma physics at the University of California at San Diego, says, “The findings are potentially of great importance,” because they could solve a key problem facing the design of next-generation fusion reactors: the occurrence of unpredictable bursts of heat from the edge of the confined plasma, which can “fry” some of the tokamak’s internal parts. “The I-mode eliminates or greatly reduces” these bursts of heat, “because it allows a steep temperature gradient — which is what you want — but does not allow a steep density gradient, which we don’t really need,” he says. Rich Hawryluk, a researcher at the Princeton Plasma Physics Laboratory, says this is a "significant advance" which has generated considerable international interest and that other groups are now planning to follow up on these results. One area of research will be whether it is possible to "reliably operate in the I-mode and not go into the H-mode, which might have these violent edge instabilities. The operating conditions and the control requirements to stay in I-mode need to be better understood."